The antibody does not cross-react with other sirtuin family members. Expression levels of the target protein vary with sample type and some optimisation may be required. For western blotting, more concentrated lysates may be required when using tissues samples. Synthetic peptide within Human SIRT1 aa 700-800 (C terminal). The exact sequence is proprietary. WB: HeLa, Jurkat, HEK293, SW480 and A549 cell lysates. IHC-P: Human colon carcinoma and human lung squamous carcinoma tissues. Flow: HeLa cells. IP: Jurkat whole cell lysate (ab7899). Our Abpromise guarantee covers the use of ab32441 in the following tested applications. WB 1/20000. Detects a band of approximately 110 kDa (predicted molecular weight: 82 kDa). Detects a band of approximately 110 kDa (110-121 kDa) which is likely to be due to post translational glycosylation. SIRT1 is known to bind to several other proteins, and the 121kDa band could also be due to the presence of one of these complexes (ensure samples are adequately reduced and denatured). IHC image of SIRT1 staining in a section of formalin-fixed paraffin-embedded normal human colon* performed on a Leica BONDTM system using the standard protocol F. The section was pre-treated using heat mediated antigen retrieval with sodium citrate buffer (pH6, epitope retrieval solution 1) for 20mins. The section was then incubated with ab32441, 1/250 dilution, for 15 mins at room temperature and detected using an HRP conjugated compact polymer system. DAB was used as the chromogen. The section was then counterstained with haematoxylin and mounted with DPX. IHC image of SIRT1 staining in a section of formalin-fixed paraffin-embedded normal human colon* performed on a Leica BONDTM system using the standard protocol F. The section was pre-treated using heat mediated antigen retrieval with sodium citrate buffer (pH6, epitope retrieval solution 1) for 20mins. The section was then incubated with ab32441, 1/250 dilution, for 15 mins at room temperature and detected using an HRP conjugated compact polymer system. DAB was used as the chromogen. The section was then counterstained with haematoxylin and mounted with DPX. The inset secondary-only control image is taken from an identical assay without primary antibody. Immunohistochemical staining of paraffin embedded human cerebral cortex with purified ab32441 at a working dilution of 1 in 150. The secondary antibody used is a HRP polymer for rabbit IgG. The sample is counter-stained with hematoxylin. Antigen retrieval was perfomed using Tris-EDTA buffer, pH 9.0. PBS was used instead of the primary antibody as the negative control, and is shown in the inset. Immunofluorescence staining of SH-SY5Y cells with purified ab32441 at a working dilution of 1 in 150, counter-stained with DAPI. 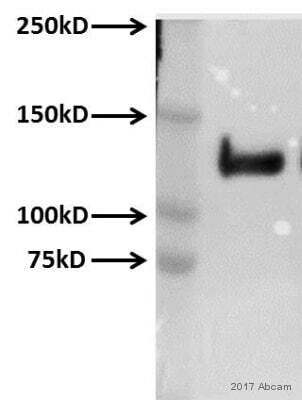 The secondary antibody was Alexa Fluor® 488 goat anti rabbit (ab150077), used at a dilution of 1 in 500. The cells were fixed in 4% PFA and permeabilized using 0.1% Triton X 100. 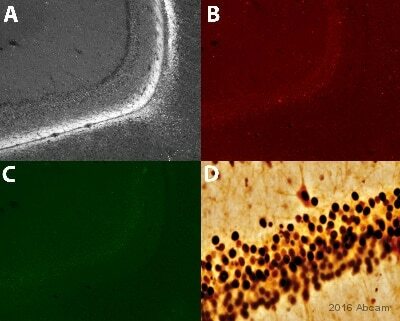 The negative control is shown in bottom right hand panel - for the negative control, purified ab32441 was used at a dilution of 1/200 followed by an Alexa Fluor® 594 goat anti-mouse antibody (ab150120) at a dilution of 1/500. Flow cytometry analysis of HeLa (human cervix adenocarcinoma) cells labeling SIRT1 (red) with ab32441 at a 1/200 dilution. Cells were fixed with 4% paraformaldehyde and permeabilized with 90% methanol. A goat anti-rabbit IgG (Alexa Fluor® 488) (ab150077) was used as the secondary antibody at a 1/2000 dilution. Black - Rabbit monoclonal IgG (ab172730). Blue (unlabeled control) - Cells without incubation with the primary and secondary antibodies. ab32441 (purified) at 1/30 immunoprecipitating SIRT1 in Jurkat cells (Lane 1). For western blotting, a HRP-conjugated anti-rabbit IgG (H+L) was used as the secondary antibody (1/1000). This blot was produced using a 4-12% Bis-tris gel under the MOPS buffer system. The gel was run at 200V for 50 minutes before being transferred onto a Nitrocellulose membrane at 30V for 70 minutes. The membrane was then blocked for an hour using 3% Milk before being incubated with ab32441 overnight at 4°C. Antibody binding was detected using an anti-rabbit antibody conjugated to HRP, and visualised using ECL development solution. Immunohistochemical analysis of paraffin-embedded human colon carcinoma using unpurified ab32441 at 1/100 dilution. Immunohistochemical analysis of paraffin-embedded human lung squamous carcinoma using unpurified ab32441 at 1/100 dilution. Does your ab32441 react with mouse sample? On the sheet it looks not working but today I checked with my mouse ES cell lysate. I could detect a band little smaller than human sample. It looks make sense as the protein size. Could you check that for me? may bind the mouse protein if enough residues overlap with the antibody. know about your findings and to earn Abpoints. Nous avons commandé chez vous 1 Anticorps Anti SIRT1 (ab32441). Je n'obtiens aucune bande. J'ai essayé plusieurs concentrations de 25 à 75ug de protéines issues de la culture cellulaire de Fibroblastes humains. Je dilue l'anticorps primaire dans du PBS Tween (0,1%) et du blocking buffer de chez Li-Cor (Volume:Volume). J'ai la aussi essayé plusieurs dilutions différentes de 1/800 à /5000. Je n'ai pas de résultats. Je n'ai bientot plus d'anticorps et n'ai toujours pas de résultats alors que sur les mêmes membranes j'obtiens des bandes pour l'anticorps anti-SIRT4 ab10140. Auriez vous des explications à me proposer ? Que puis-je faire pour obtenir un signal ? Merci de nous avoir contactés et signalé l'anomalie rencontrée avec l'anti-SIRT1 ab32441. je pense que cet anticorps aurait du fonctionner en suivant votre protocole et que vous avez malheureusement du recevoir un tube de produit non-fonctionnel. - un avoir ou un remboursement contre la commande originale. Merci de m'indiquer la résolution qui vous conviendrait le mieux. Our technician contacted the ITK diagnostic and they are waiting now for the antibody. Can you please sent it? I am sorry this product did not perform as stated on the datasheet and for the inconvenience this has caused. As requested, I have issued a free of charge replacement with the order number 1080353. Thanks a lot, I wait the product for the 20th of August. I hope you had good holidays! I was placing an agreed order for you however it seems you have purchased this antibody from ITK diagnostics. Could you please let them know Abcam has agreed a free of charge replacement for ab32441 so they should know when it arrives. Once you done that please let me know I will validate your order. I would really appreciate a replacement of the Sirt1 antibody from a different lot. I would also like to have, if it is possible, a picture of a western blot probed with that antibody from that lot. Thanks very much. As I’m leaving for holydays from this Friday, is it possible to have the antibody before (19-07) or if not, after the 20th of August? We have observed some shipping delays in Netherlands so I will try to ship this product on 19th of August for 20th August delivery. Please let me now if you have any question. I apologize for the inconvenience and am pleased to offer you a free of charge replacement from different lot, credit note, or refund in compensation.